This tutorial guides you through the process of creating a simple application powered by ADO.NET Entity Framework using Visual Studio 2010 or higher. In less than 5 minutes you will have a ready-to-use data access layer for your business objects. Please note that this tutorial is not applicable for Entity Framework Core. It is intended for previous Entity Framework versions. The ADO.NET Entity Framework is an object-relational mapping (ORM) framework for the .NET Framework. It is designed to enable developers to create data access applications by programming against a conceptual application model instead of programming directly against a relational storage schema. The goal is to decrease the amount of code and maintenance required for data-oriented applications. To connect to a MySQL server, you need dotConnect for MySQL installed and IDE running. ADO.NET Entity Framework requires .NET Framework 3.5 Service Pack 1 or higher, Visual Studio 2008 Service Pack 1 or higher, and MySQL server 5.0 or higher. Note that Entity Framework support is not available in the Standard Edition of dotConnect for MySQL. For Entity Framework 6, you will also need a NuGet Visual Studio extension installed since it is used for adding EntityFramework NuGet package. Alternatively you may create model for Entity Framework v1 or v4, which don't require NuGet, in this tutorial. 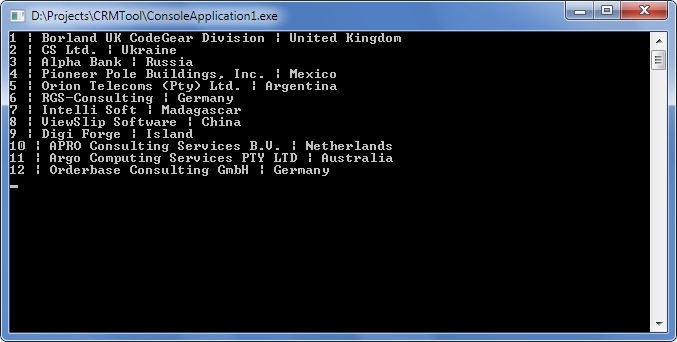 In this sample we will create a simple console application. It could be any other project type as well, but for simplicity's sake we'll use console project throughout the tutorial. Start Visual Studio and create a new console application. The following actions are required if you want to create an Entity Framework v6 model. Open the Package Manager Console window and execute the following command in it. Note: replace 8.3.215.0 with the actual assembly version. After this you need to rebuild the project before running the EDM wizard. In the Solution Explorer, right-click the project and select Add | New Item. In the dialog box, select ADO.NET Entity Data Model, click Add. This launches Entity Data Model Wizard. 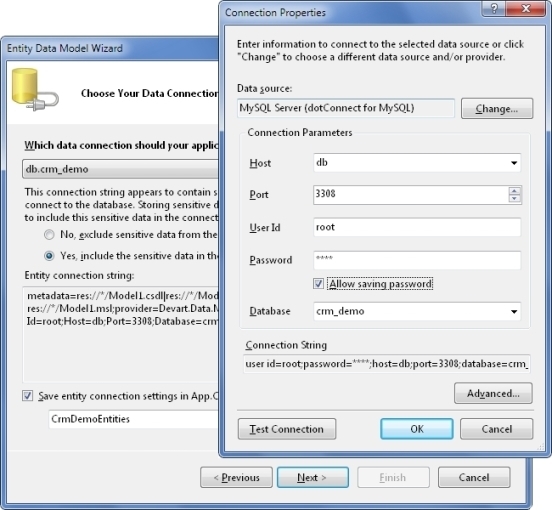 In the wizard, se3lect Generate from database and click Next. Pick an existing dotConnect for MySQL connection string or create a new one. When creating a new connection, select MySQL Server in the Data Source list, then dotConnect for MySQL in the Data provider list. See the screenshot below. Agree to include the sensitive data in the connection string. In the field Save entity connection settings..., type CrmDemoEntities. This will be the name of the main data access class. Click Next. 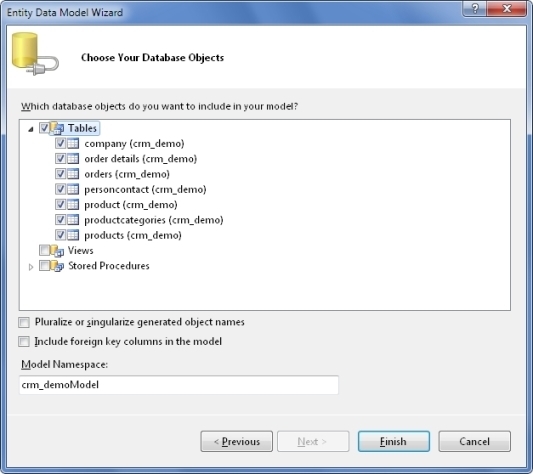 Select database objects that will be used in the model. These are all objects from the crm_demo script, including auxiliary tables. Click Finish. The model will be generated and opened in EDM Designer. The model you've just generated is ready to use. Its name is Model1.edmx, unless you changed it in the step 2. You can inspect it visually in the designer or take a look behind the scenes with XML Editor. The wizard creates classes for all selected tables that represent entities. It also creates a descendant of the System.Data.Objects.ObjectContext class, which controls the connection to the database, and the whole data flow. This class includes properties and methods named after your database objects. You will use these members to retrieve and modify data in the context. The code is contained in an autogenerated file Model1.Designer.cs (Model1.Designer.vb). All Entity Framework operations are executed through the ObjectContext descendant, which is named CrmDemoEntities in this tutorial. To retrieve data, you have to first create an instance of the context, then prepare a query with LINQ to Entities or EntitySQL or their mix, and then access the object returned by the query, which may be a collection of objects or a single object. As simple as that. You prepare a query and then iterate through it as you would do with a usual collection of objects. 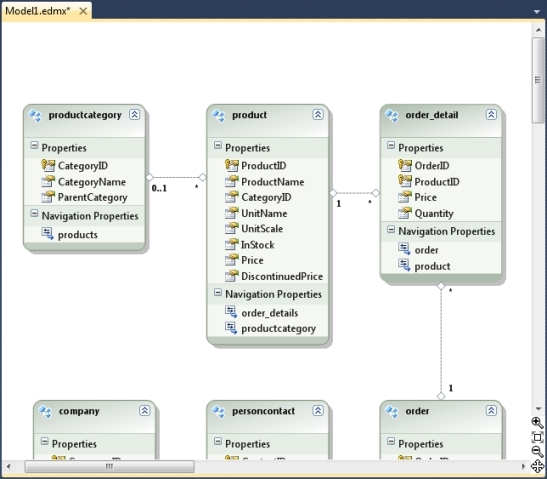 The database interaction is performed by Entity Framework in the background. Now let's see who is who in this code sample. CrmDemoEntities is the name of the class that knows all about your model and does everything to handle it. You named it in the step 6. All Entity Framework operations are performed within this class's properties and methods. It is recommended that you keep a single instance of the class throughout your application because it consumes lots of resources. query, it - these are arbitrary variable names in the LINQ to Entities statement. The former is used as the collection of data objects, the latter is not used outside the statement. context.company refers to a public property of the CrmDemoEntities class. This property represents the collection of all companies in the context. company (in the foreach statement) is the name of an autogenerated class. This class maps to the company table in the database and is named after it. Note that the LINQ to Entities query code just describes the query. It does not execute it. This approach is known as deferred execution. This sample is much like the previous one, with the exception that it adds the Include method that instructs the query to retrieve data from one more table. What earlier was adding rows to tables, now is just adding new objects to context collections. When you are ready to send the changes to the database, call the SaveChanges() method of the context. Before doing this, you must first set all properties that do not support null (Nothing) values. The SaveChanges() method generates and executes commands that perform the equivalent INSERT, UPDATE, or DELETE statements against the data source. // Send the changes to the database. // Until you do it, the changes are cached on the client side.
' Send the changes to the database.
' Until you do it, the changes are cached on the client side. The methods AddToProductCategories, AddToProducts, and others are automatically generated in the context. Such methods exist for every class in your model. Note that after you have added the new product and category by submitting the changes, you cannot execute this solution again as is. To execute the solution again, change the names and IDs of the objects to be added. Entity instances are modified as usual. The only thing to remember is that you have to invoke the SaveChanges() method to send the data to the database. To extract an instance from a context, use the DeleteObject method of the context. The object is removed from the collection of its type, but not destroyed. To delete the object's data from the database, invoke the SaveChanges() method. Now that you can perform the basic data manipulation with Entity Framework, you can move on to some advanced topics. We recommend you to use Entity Developer (Devart Entity Model, *.edml) instead of EDM Designer (ADO.NET Entity Data Model, *.edmx) because it is adjusted for working with MySQL and has an advanced functionality. Additionally, Entity Developer adds registration of EF6 provider in app.config automatically and offers designer (Database First / Model First) for EF Core. For hands-on experience, download the separate Entity Framework Query Samples package or use samples shipped with dotConnect for MySQL. These samples are described in the Entity Framework Query Samples article. You also can access the samples from the Start menu. To understand deeper the works of Entity Framework engine you can watch the generated SQL statements in dbMonitor.